The movements of the Russian Black Sea Fleet’s armored vehicles in Ukraine’s Autonomous Republic of Crimea are in full compliance with Russian-Ukrainian agreements, Moscow has said. Russia has passed a note regarding the maneuvers to a minister-counselor at Ukraine’s embassy in Moscow, Ruslan Nimchinsky, the Russian Foreign Ministry said in a statement Friday. On Thursday, the Russian charge d'affaires in Kiev, Andrey Vorobyev, was summoned to the Ukrainian Foreign Ministry and handed two diplomatic notes - one on the latest events in Ukraine and one asking Russia’s Black Sea fleet units to abstain from movements outside their deployment sites. 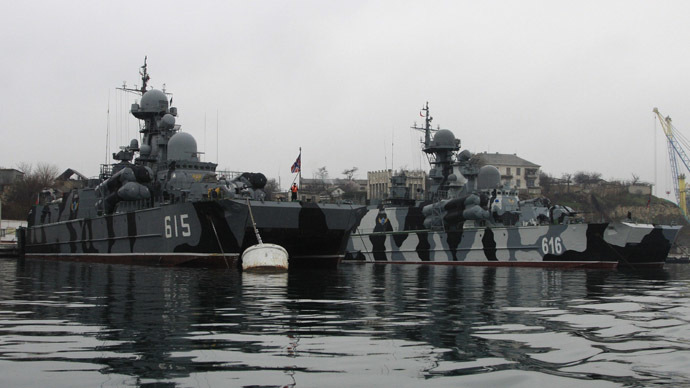 “The Russian Foreign Ministry has passed an reply to the Ukrainian side on the movement of the Black Sea Fleet armored vehicles in Crimea, which is caused by the necessity to provide security for the Black Sea fleet’s naval deployment areas on Ukrainian territory, which happens in full accordance with basic Russian-Ukrainian agreements on the Black Sea Fleet,” a statement published on the Russian Foreign Ministry’s website reads. Meanwhile, the Russian Black Sea Fleet’s press service dismissed reports that Russian troops were blocking Belbek airport near the port of Sevastopol in Crimea. "No units of the Black Sea Fleet were deployed in the area of Belbek [airport], nor did they take any part in blocking it," a statement from the fleet's press service reads. The comment followed reports in some media that the airport was being patrolled by a group of unidentified armed people. It was alleged that Russian troops arrived to “prevent the arrival of some militants,” Interfax news agency reported. On Friday evening, Crimean self-defense squads raided the international airport in the republic’s capital, Simferopol, searching for Ukrainian airborne troops. They found no military personnel inside, but are still patrolling the grounds of the airport. Airport security said the squads are helping to ensure safety at the airport. Russia says that the latest developments in Crimea come as a result of internal political processes in Ukraine. “The Russian side considers the events on the Autonomous Republic of Crimea a consequence of recent internal political processes in Ukraine and, in that context, sees no necessity to hold urgent bilateral consultations which were proposed by the Ukrainian side,” the Foreign Ministry said after a meeting with Ruslan Nimchinsky. On Friday, Russian diplomats met in Moscow with Nimchinsky, and handed him a reply. Earlier, Kiev proposed holding urgent bilateral consultations on the events in Crimea – based on the Agreement on Friendship, Cooperation and Partnership signed in 1997.